One pot dishes are all I want when the weather turns nippy (bit of a euphemism here) and the days are sooo short you feel like putting something to simmer away at half past four! For the marinade : Mix into a bowl 50ml of olive oil, 50ml of sunflower oil, 1 teaspoon of sweet paprika, same of cumin and grated ginger plus salt and pepper. Crush 3 cloves on garlic in the mix and add a pinch of saffron. Cut up a bay leaf and grate the two tomatoes on a flat grater so you just get the flesh and discard the skin once finished. Mix it all well. First, soak the flat bottom of the dish in water to avoid cracking on heat. 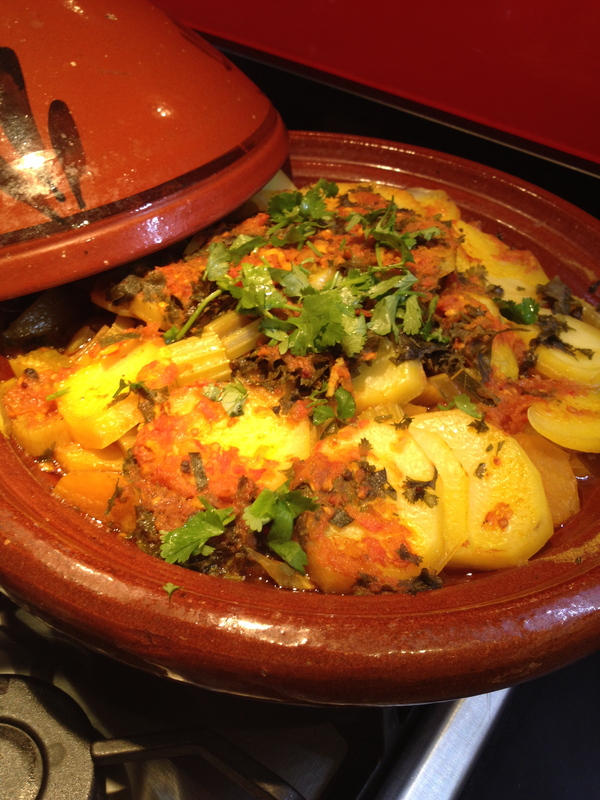 This is a very important step if you want to keep on using the tagine! Slice the onions finely and lay at the bottom of the dish. Cut up the carrots, celery and fennel in sticks and put a layer over the onions. 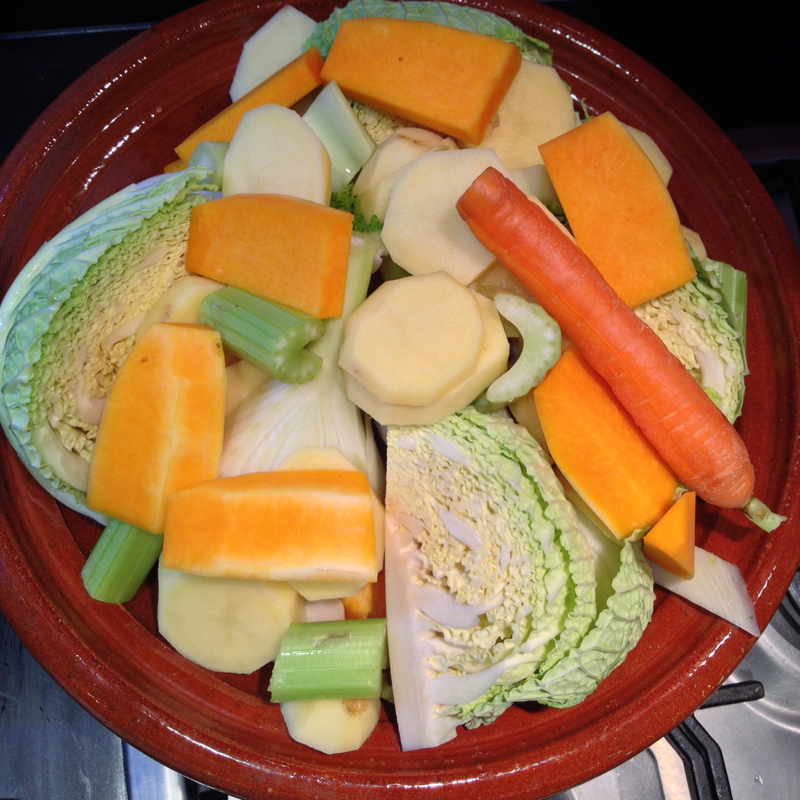 Cut large chunks of the cabbage and then thick slices of the potatoes and arrange them on top. You can use any seasonal vegetables so next summer it might be courgettes, aubergines or anything else you fancy for that layer just before the potatoes. Slice one fresh or preserved lemon and some black olives on top. You can also add a handful of pre-cooked chickpeas instead of olives. 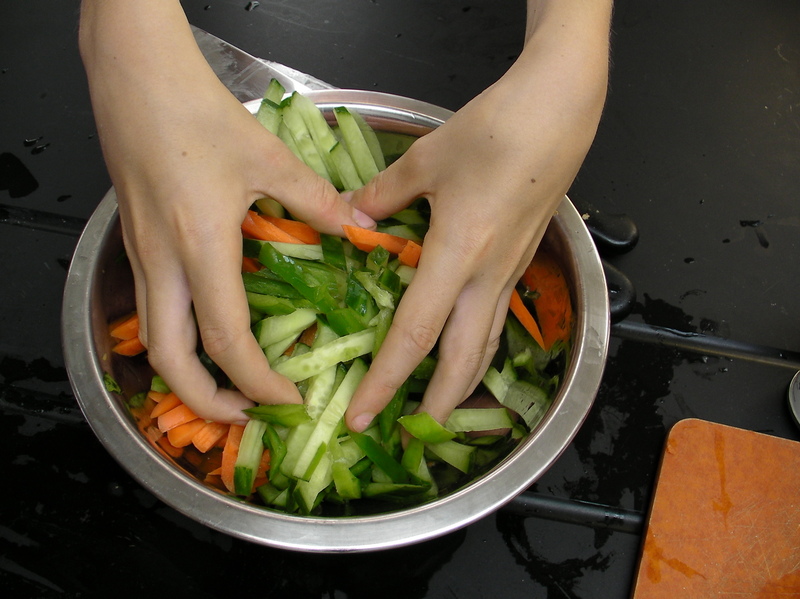 Pour the mix over the vegetables arranged in a pyramid shape. Add a glass of water. Put the dish directly on low heat (or using a heat diffuser) for about 2 hours – ideally without opening the lid but do if no more steam is coming out! Sprinkle with parsley and coriander before serving in the dish – pipping hot. This soup is warm but requires no cooking. So it’s ideal for time-poor students or older persons who want a healthy meal without the hassle of cooking it. Blend all the ingredients until smooth in a food processor and serve warm with boiled eggs (chopped) and red pepper cubes, for a nice colour contrast. Season generously and choose either sweet or hot paprika, or both, according to your inclination. I also like this soup with a generous slice of bread covered in Sobressada from Mallorca. This paprika flavoured sausage can be spread easily and comes to reinforce the smoked paprika hint already in the soup. This is very gentle on your digestive system as well as being very restorative due to the high potassium content of both avocado and paprika. The healthy oils in the avocado are excellent for the skin and the brain. An all singing, all dancing vegetarian dish to shake our bodies out of the summer slumber! This is as rejuvenating as an outdoor yoga class or a jog in a bluebells’ wood. The miso and Umeboshi (marinated prune paste) are very good and calming for the intestines and will help restore depleted energies. You can find the miso paste and the umeboshi paste in Japanese shops and most health shops in the UK. The Japanese use them to restore intestinal bacteria after an illness or a course of antibiotics. The umeboshi is quite tangy and salty in taste so you will not need to add any salt if you use it – Especially combined with Miso. You can do without those weird and wonderful ingredients and replace them with a good chicken or vegetable stock if you prefer . I just wanted to include a healing and strengthening aspect into my recipe . Both versions are delicious. This quantity serves 5/6 as starter portions or 3 as main. Halve all quantities to cook a plentiful meal for one! There should be just a bit left over for the dog. This month is the perfect time to use up the latest asparagus and broad beans from the garden or allotment. They are still coming up on market stalls at a bargain. I have even seen them recently at a Pick-your-own farm! Chop up the shallot and fry it in a little olive oil. Then throw in the rice and fry that too until the grains look transparent. Add the wine and simmer until it is almost gone. Then add half the stock and continue simmering and turning. The secret of a good risotto is to add the liquid in stages and to keep the mix soupy and wet until the end so it does not dry too much as it cools down in the plate. Keep simmering and adding stock until the rice is cooked. Meanwhile (or previously), you have washed and trimmed the asparagus and steamed them. The broad beans need to be shelled but not pre-steamed. You need to season with the umeboshi and the miso paste about 5/10 minutes before the end- not before because boiling would destroy a lot of the healthy bacteria. Add the asparagus stalks but keep the tips aside. Add the broad beans as well towards the end of the cooking and cover. Rice usually takes 20 min in all. 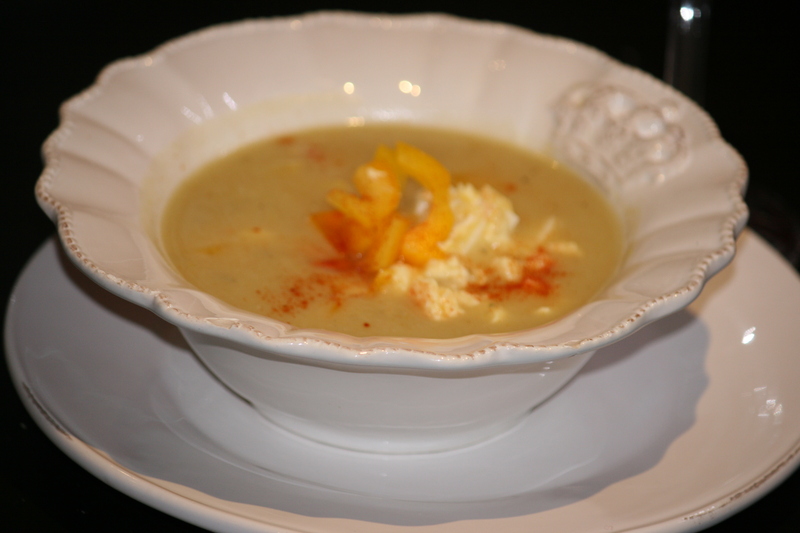 Dress with a dash of cream, some pepper from the mill and serve warm but not hot. Here I have used fresh peas and decorated with fresh mint from the potted garden. First soak the noodles 5 minutes in boiling water. Rinse with cold water, drain and reserve. They must be still firm but malleable and gone completely translucent. Fry your cherry tomatoes and strips of carrot and red pepper in a wok with a spoonful of rapeseed oil. Reserve. Start dicing the avocado, chopping the cucumber in strips (ideally with a mandolin or grater) and slicing the spring onion finely lenghtwise. 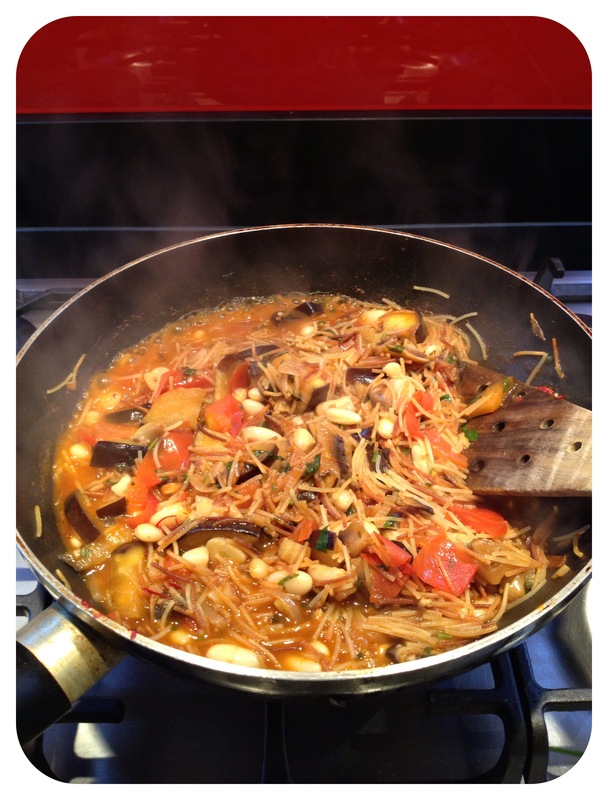 Throw the drained pasta in to the wok, season with soy sauce, rice vinegar and ginger or 5 spices. Shake around the wok until coated with the sauce and warm. Assemble all the vegetables in a dish then throw the noodles in and season with some more soya sauce and crushed ginger, the pressed garlic and some rice vinegar. Add a dash of olive or sesame oil if too dry. The salad must be generously dressed and have a certain bite! Tear some basil into it and serve at room temperature . A handful of frozen mussels or prawns or a handful of butter beans – if you want to keep it veggy. Today I am revisiting an ingredient used last year as Black Vermicelli and this time I use the normal version, available at Spanish delis or specialised gourmet shops . It is worth hunting for because it produces a super dish in minutes. The French mostly put “fideo” in soups but the Spanish use it to do a quick and tasty version of the ubiquitous paella. Choose the Fideo number one for the thinner quality. 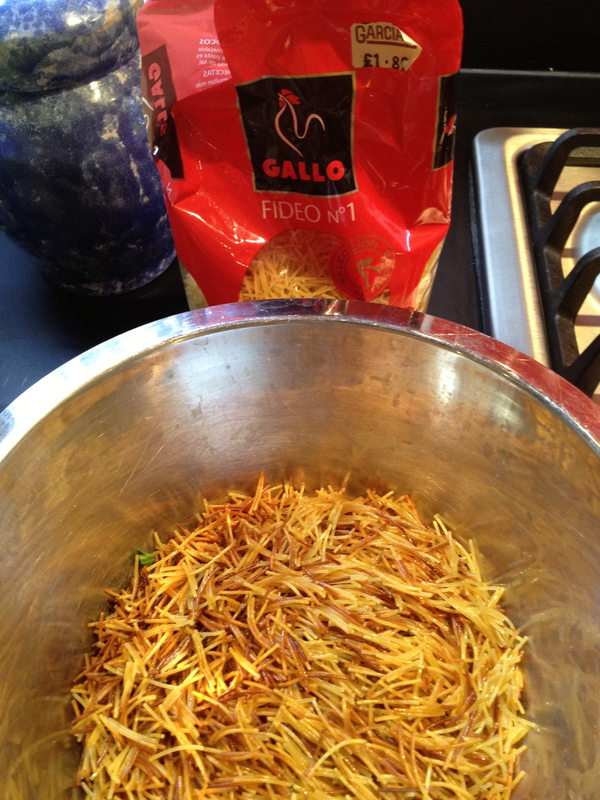 Start by toasting the fideo in a shallow frying pan with a bit of olive oil. If you can, use a pan that can also go into the oven. When the Fideo turns brown, reserve in a bowl. Make a Spanish “sofrito” with the onion, garlic and parsley all chopped up. Fry it in the same pan. 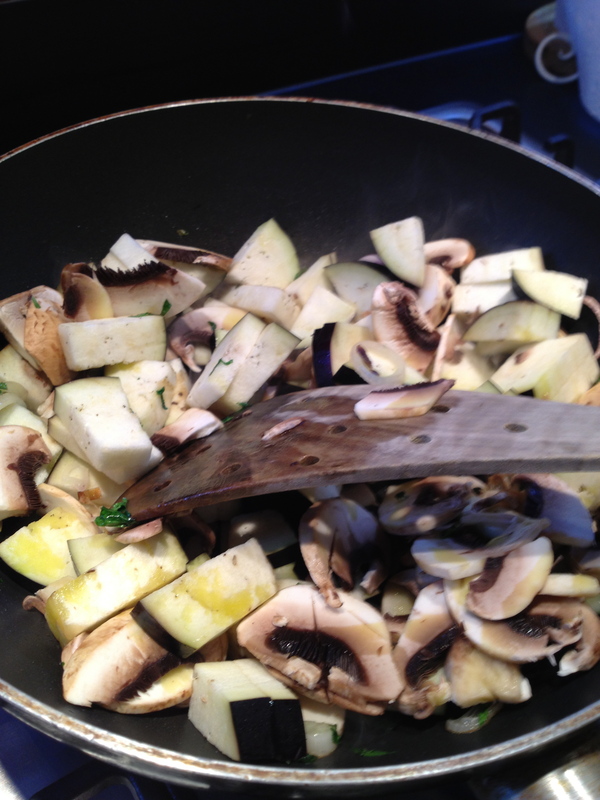 Add the tomatoes chopped up, the courgette, mushrooms and paprika, cumin and a pinch of saffron. Cook and move about a little until the mix soften and add enough tomatoes to make a thick sauce – you can use a half tin of chopped tomatoes if easier! No harm in cutting corners, is there?! Add the noodles underneath the veg if you can, by pulling them up with a spatula. Pour the warm stock in. 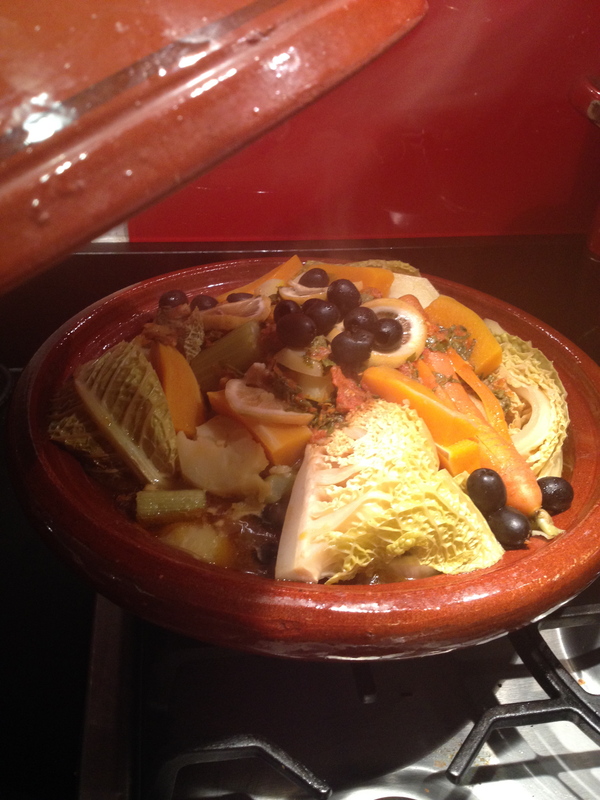 Allow to cook on slowly until all the liquid is absorbed – do not cover. It will take less than 15/20 min. A few minutes before the end, you can add a few frozen prawns or mussels to jazz it up but you really don’t have to. Just before serving – if your pan allows- put the dish under the grill and get a crispy top in 4/5 minutes. 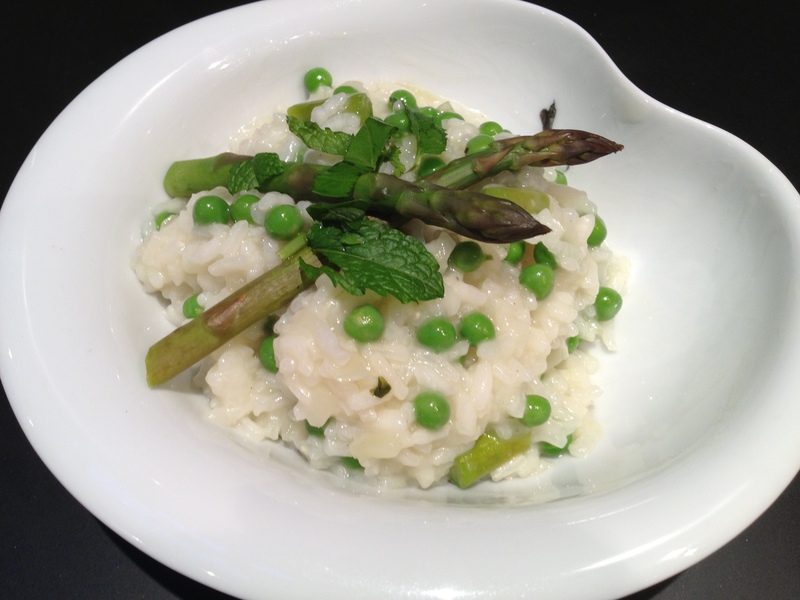 Serve with lemon wedges and a sprinkling of fresh parsley. This is a delicious last minute dish! Most of it is pulled out of a cupboard or freezer. But with the addition of a few fresh vegetables, you can produce a very healthy lunch. Customise according to what you have and it is great every time… The version on the picture above had butter beans, red peppers and aubergines, for example.